Change is a part of life. Whether positive or painful, coping with changes can be stressful. But certain strategies help, and I can speak from personal experience, having just come through some significant changes in my own life. The big change for me came when I decided to move back to Ireland for a year this Spring, after having lived abroad for 32 years. Now that my mother was 91, it seemed a good time to return. What I hadn’t anticipated was how much work it would take to pack up my life and my house. The planning, renovations, decluttering, cleaning and packing up was so intense at times, I could hardly breathe. If not for the kind help of friends and neighbours, we would never have finished on time! But the final day arrived, we said our goodbyes and boarded the plane for Ireland. That was 16 weeks ago, and it is great to be home and reconnect with family, friends and familiar places. We have been busy setting up new phone plans, bank accounts, work visas and car insurance, and learning how things are done differently here. But we are still finding our feet and sometimes I miss my familiar life in Canada, our house, good friends and of course my cat Kooper, who is being looked after by a neighbour in Victoria. #1 Change means stepping out of your comfort zone, so expect to feel uncomfortable for a while. At the same time if you plan and prepare, it reduces the unexpected, and you will feel more in control. The more information for example we gathered beforehand about insurance, rules, taxes and visas require, the less vulnerable we felt as we embarked on this move. #2 Avoid too much change happening at once if you can. If you are going to change jobs, don’t move house and get divorced all at the same time! It is better to pace yourself and maintain some parts of your life to balance what’s new. Moving countries is a big change, but it helped that I was returning to my hometown and family, and that I planned to continue working with my Canadian clients online. #3 Try to maintain familiar routines in times of change, so your life feels more normal. When there is a death in the family for example, it is often reassuring for children to return to school soon afterwards, because it is one area of their life that hasn’t changed. When I moved back to Ireland, it helped that I continued to exercise, meditate and journal, as these were familiar self- care routines for me. When I joined a local gym in Ireland for example, it reduced the feeling of being adrift. #4 Bring some familiar possessions when you move, whether it’s photographs, your favourite mug or your diary. I brought a large box of my favourite Earl Grey tea for example, and a supply of my favourite pens that are harder to find in Ireland. Ironically, I found the same brand of tea in Ireland at a cheaper price! #5 If you have to move, keep in touch with old friends for support. With technologies like Skype, Zoom and Facetime, as well as social media, it is so much easier to stay connected to close family and friends living far away. I found when I went back to Ireland for four months last year, it was important to stay connected with my friends in Canada on Facebook. #6 If you are finding the change you are going through difficult, seek help. Talk to trusted friends or find a counsellor you feel comfortable with. 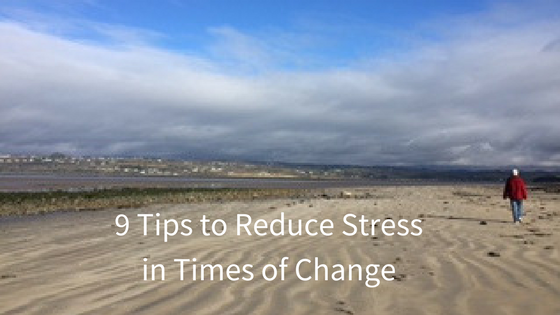 I sought out extra support for example when I was preparing to go to Ireland, which helped me manage the level of stress I was experiencing. #7 Understand that change is tiring – and that everyday routines we take for granted help save us energy. A good example of this is how tired you feel when you start a new job, even if there is very little work to be done at first. It takes a surprising amount of energy to learn new tasks, routines and names. #8 Recognize that change can trigger feelings of insecurity and fear. Changes may provoke more anxiety than they need to, because of the stories we attach to them from painful childhood experiences, e.g. when we expect the worst to happen. A few hours of counselling can help put some of these early experiences to rest, so you can face your future with more confidence. #9 If a change is unwanted, overwhelming or threatens your well being, consider seeking spiritual help. Some people find surrendering to their Higher Power can bring a feeling of peace in the midst of painful emotions. Are you going through a major life change right now? Do you wonder if it’s normal to feel anxious? Take advantage of Grace’s offer of a complimentary talk on the phone. Click this link to set up a 15-minute time at your convenience. A very timely blog as I am currently off work on sick leave and this is a big change. I am managing well as I really need the break. After having an accident and then continuing working for 4 months it became apparent that I really need the break. I really liked the phrase you wrote in the article for the Irish Times, “As I slowed down and settled in, an unexpected joy stole over me, and my bones relaxed.” I am feeling the same way. I think in this world especially in North America we are expected to be doing so much all the time. I am all for the slow human movement! I hope you discover where you need to belong and settle into the life in Ireland. What a treat! Thanks Caroline. Appreciate your kind feedback. Best wishes for your recovery.